Zulal Destination Spa and Family Resort is an amazing design concept of Oppenheim Architecture and Design in Khasooma, Qatar. Lies a crescent shaped place, the project has an architecture like as a spaceship station with a giant circle-shaped border. From the architects: Staying true to the DNA of the Qatari village, the spaces and gestures of the Zulal Destination Spa and Family Resort spring from the first principle of the courtyard. Each courtyard scattered across the site as moons across the heavens; centripetal points around which the accommodations revolve. Formally, it is a reversion to geometric primitives and the inscriptions of Islamic astrology against the landscape of the desert. A composition that is reminiscent of the primary knowledge of the ancients. Earnest and timeless, the architecture of Zulal is simultaneously powerful, yet comfortable; primitive, yet innovative; casual, yet elegant; raw, yet refined. Zulal’s architecture merges with the stillness of the land, arching with the flow of the currents in the sea to create luxury spa accommodations that are beautiful and timeless. Our proposal establishes itself on the landscape, and recedes into the landscape playing the counterpoints of presence and absence, the references of above, below and in-between, establishing balance. Gardens, pools, meeting and meditative spaces are all found in the interstitial spaces at the gathering of program. 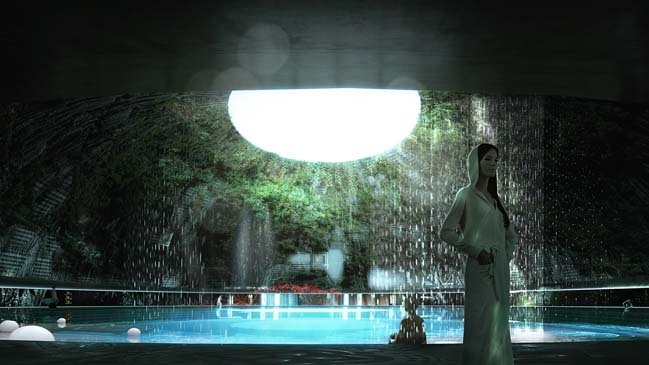 The resulting experience is sensual and sensitive, intentionally reduced to what is essential – romantically establishing a simple connection with the sea through bold, elemental forms, sincere materiality/detailing, and the florid use of Qatar’s bountiful natural resources. Here the topographic transition from the desert dunescapes to the beach creates a welcomed transition from the sand to the sea. It stays true to the ancient vernacular traditions of in-earth building, having a reverence for the landscape, and the materials of the region. The landscape dissolves to a scattering of the luxurious units, which are interspersed with verdant gardens. Pools and gardens are interlaced throughout the constellation of villas and take full advantage of the spectacular views of water, earth and sky, and the ever-present solemnity of the sea. The spaces have been arranged to provide unobtrusive privacy and a visceral connection to earth, sky and water. Our solution equalizes the power on site by establishing a balance of elemental mass, and a composition of bold and simple forms. Designing with the most ancient as well as the latest construction techniques and materials, we have pushed the illusion just within the limits of reality. A vibrant dialogue between built form and landscape, inspired by, and in awe of the power of the desert and the sea. Recalling the forts of Qatar and a culmination of the eternal impact of the civilization in which it stands connected by a perimeter wall on the horizon, allegorically embodying the crescent moon, creating peace, solemnity and tranquility within.